My motivation for becoming a saltwater fly fishing guide is simple; There is very little I love more than sharing these fisheries I love so much with others. It truly is the most rewarding experience I can think of. I began fishing at the age of 4, and began fly fishing at the age of 15. 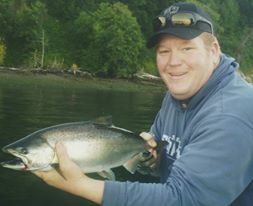 I have a wide range of fishing experience, from gear fishing in rivers for salmon, trout, and steelhead, to offshore ocean fishing for halibut, lingcod, salmon, rockfish and albacore tuna to fly fishing for all five species of Pacific salmon, sea run cutthroat, rockfish, lingcod, trout, sculpin, flounder etc. If it will eat a fly, I'm down to fish for it! I have also spent the bulk of my life working on boats in one form or another. I spent 4 years after high school working on commercial surimi boats in Alaska's Bearing Sea. I spent 10 years working for the federal government in a Naval shipyard, repairing nuclear aircraft carriers and submarines. 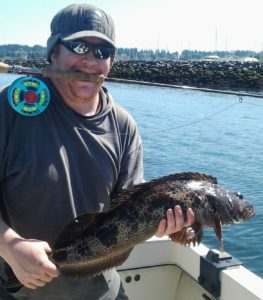 I spent one summer commercial fishing for albacore tuna out of Westport, Washington, and have spent three seasons working as a deckhand and captain on six-pack charter boats out of Westport gear fishing for salmon, lingcod, halibut, rockfish and albacore tuna. 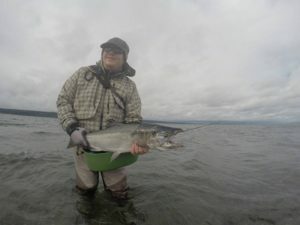 As much experience as I have in all sorts of pacific northwest fishing, it's saltwater fly fishing that is my first love. 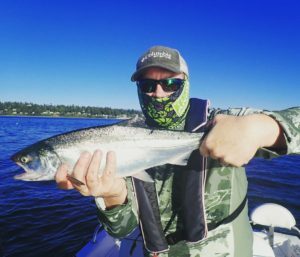 There is simply nothing I'd rather do than ply the salty waters of the Pacific Northwest with fly rod in hand. 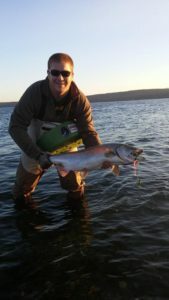 I feel that my wide range of fishing experience gives me a unique approach to saltwater fly fishing, and I try to implement my wide range of experience into every fishery I partake in. 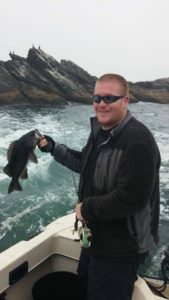 When you come fishing on my boat I am going to emphasize two main factors: Safety, and having fun. First and foremost I want everyone who comes out with me to return home safely. I promise to put the safety of you and yours above all else on any trip. My second focus will be on having fun. 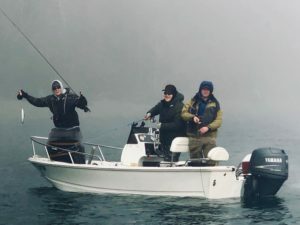 There is nothing I enjoy more than spending time fly fishing the saltwater, and I want to make your experience one that you will remember and cherish. Above all else, fishing is supposed to be fun, and I will focus on making sure that is the case. I am a laid back guy who enjoys laughing and having a good time. Come fish with me and you'll experience this for yourself! AS CAPTAINS OUR NUMBER 1 PRIORITY IS GETTING EVERYONE HOME SAFELY. WE PROVIDE NUMEROUS PFD OPTIONS AS WELL AS A SAFETY ORIENTATION PRIOR TO EMBARKING ON ALL GUIDED TRIPS.